A combination of Medina Soil Activator plus over 40 trace elements. GARDENS AND FLOWER POTS: For small areas and flower pots, mix 6 tablespoons or 3 ounces in a gallon of water and apply to the foliage with a pump sprayer or a sprinkling can. Repeat every 2 weeks as needed during fruiting and flowering season. TRANSPLANTING: To increase the root growth and reduce transplant shock, new plants can be watered in with a mixture of diluted Medina Plus. 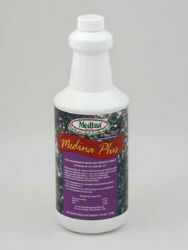 Mix 1 ounce of Medina Plus per gallon of water and pour slowly to wet all of the loose soil around the new plant. YARDS AND LARGE AREAS: Medina Plus is available in a ready-to-use bottle, simply connect hose to top and open valve. For use with a hose-on sprayer with adjustment: set for 6 tablespoons or 3 ounces per gallon. Fill the container with undiluted Medina Plus. One quart should cover 1,000 square feet. Continue spraying an area of 1000 square feet until 1 quart is used. Do not water in; leave the spray on the foliage for one day.